Hey everyone. I found an 1893 O barber half and it’s in rough shape. Heavily worn but also covered in some black crust. 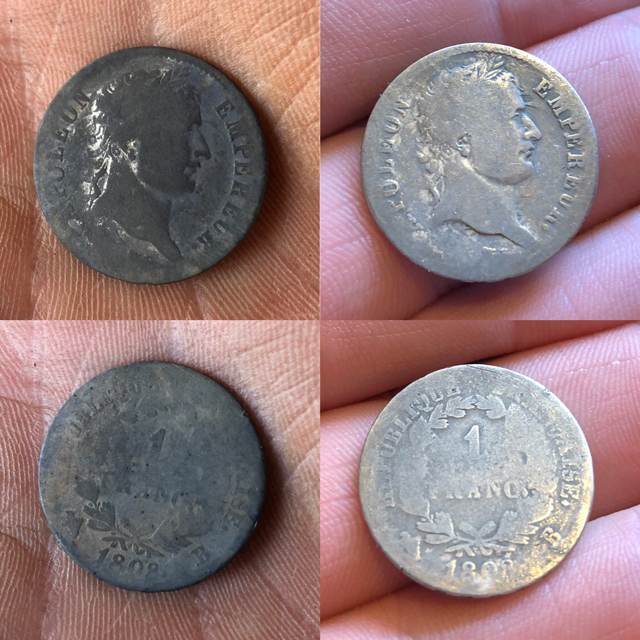 I’ve heard all about electrolysis helping removing black crust off silver coins but I’m not set up for electrolysis at this time. Any other suggestions to test? Does boiling water with aluminum foil actually work? A lady told me to put try hand sanitizer on it - never heard of that before. But I wonder if it would remove the black crust without damaging the silver... Any suggestions will be greatly appreciated. Thanks! I have my one and only walker and it was encased in iron like yours. I worked at getting it off with hard plastic scraper and a wire wheel. Its one side is worn more than the other. Also you can pick at it with wood tool too. Its hard work. Just be as gentle as possible. You can also boil it in water then freeze it many times, it may work too. I'm not sure how well this would work, but here is how I cleaned a silver round that I had: My Thread Post 1 has the before pics and post 15 has the after cleaning pics as well as the method I used. The black crud looks like another material that stuck to the coin. No easy way to remove this so the tooth pick method is probably best. You could try to determine if this crud will dissolve in something to make it easier to remove. The Aluminum foil and electrolyte method is ONLY for AgS (Silver Sulfide) the common Tarnish. This method galvanic reverses the oxidation (reduction) to form Ag and AlS (pure silver and Aluminum Sulfide). As a chemist I can tell you that cleaning a coin is part science, part art, and part luck. Since it is a nice old coin I would recommend starting gentle and then working up to more drastic measures. You can always try more aggressive techniques later but if you damage it off the bat there is no way of fixing it. I think the first thing i would try would be a couple of days soak in mineral oil. And then gently picking at it with a toothpick. It may help it may not, but if any of that crud is organic in nature it could soften it some making removal easier. Next depending upon how the mineral oil worked would be the freeze/thaw/freeze/thaw sequence that has been mentioned by others. Great Find! Good luck and keep us posted. freeze thaw will do less damage than a tooth pick rubbing that stuff against the silver. I suggest freeze thaw first then soak and pick. I soak in plain old household ammonia. may not be too good for luster, but I knew a jeweler that used ammonia in an ultra sonic machine and it worked. I just soaked a 35% silver 1945 war nickel overnite in ammonia and cleaned hard crust off that looks similar to yours. its a dug coin.. if not a key date its still a dug coin. very nice dug coin... but a dug coin. congrats. I have no problem with people who disagree or correct or point out something to me. so if anyone thinks this is bad speak up. the choice is the owners. toothpick may not scratch but it can rub the material on the coin and scratch, although I do it all the time on dug pennies. if its a high dollar key date.. send it in to be pro cleaned. Thanks everyone. I’m going to try the freeze/thaw method first. The. If necessary other measures. For the gunk I'd first try. Hydrogen peroxide. Zap the peroxide in a microwave till it boils. Add coin. Let sit till fizzing stops. If it works repeat process until clean. If that doesn't work than the foil process is the next step. Find a bowl line it with foil, enough that some is above the water. Boil water and pour it in the bowl. Add a good bit of salt and baking soda. Enough baking soda that the water is cloudy. This works but sometimes you need to touch the coin with a metal utensil or dip half in and hold other half with hand. I don't know why but it works better that way. Last resort is 1/4 cup water and 1/4 cup CLR. Amount doesn't matter half and half is best way to start. You can dilute it or strengthen it after the half and half. This last resort works best. Do not use on copper relics though. Will turn them pink. Cool! Thanks for the tips!! Try soaking it in lemon juice. Try poking it with a toothpick. Should work in getting at least some of the gunk off. Spit and foil before and after. A lemon juice bath won’t hurt either. I wish I left my silver oxide on but u have an extreme case. Thank you TrashMaster! I love that coin you found! So you spit in foil and let it sit? Or do you rub it? If the spit & aluminum foil removed the tarnish then it was AgS (Silver Sulfide) on the coin not an Oxide. This technique is a galvanic reduction of the AgS & Al to AlS & Ag (Silver Sulfide to Silver and Aluminum to Aluminum Sulfide).